When you work for the Government in Manhattan, you’re definitely not in Washington anymore! The beautiful year-round scenery of the Manhattan, Kansas, area welcomes thousands of federal and local government authorities. The recent additions of two vitally important government projects are welcome assets to the area. 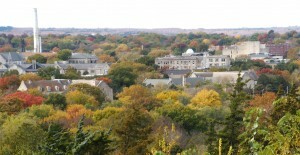 Kansas State University (KSU) is known for its major advancements in science and technology. For example, it is home to the Biosecurity Research Institute (BRI), a secure laboratory where the study of high-consequence pathogens can be studied in complete safety. It is designed for Bio Safety Level-3 research, with space available for selected commercial projects by application. The construction of the BRI in 2006 was a definite asset in the selection of Kansas State University-Manhattan as the future site of the National Bio and AgroDefense Facility - NBAF. The NBAF will be operated under the authority of the United States Department of Homeland Security, with the U.S. Department of Agriculture’s Agriculture Research Service (USDA-ARS) and Animal Plant Health Inspection Service, Veterinary Services (USDA-APHIS-VS) as primary research partners. The facility, currently under construction, is located in Manhattan, KS. The 520,000 square foot facility is scheduled to be completed by 2020, become operational in 2022 and will employ up to approximately 350 people. Realty Executives Weis Real Estate has been an important partner in supporting the acquisition and development of the National Bio and AgroDefense Facility at Manhattan-KState . We have helped every step of the way – all the way to the Nation’s Capitol! If we can now help you with your real estate needs, please contact us today to receive the exceptional professional services of Weis Realty Executives. We are dedicated to the highest standards of integrity, customer satisfaction, and professionalism, as well as exponential growth in Kansas BioSciences – and you! With the exponential growth of government work in our Region, there is an increasing need for residential and commercial real estate options. Rest assured that our highly experienced and successful residential and commercial Weis Realty Executives REALTORS® are prepared to help by sharing a wealth of helpful information with you. For more information contact us (800-593-3250) today.